. In some ways it's like a medical operating room. In reality, it's a cleaner environment in many regards. I'm sure you've seen TV commercials or reports about high-tech manufacturers that include pictures showing people working in these types of environments. They're dressed in head-to-toe full-coverage suits. These suits are not there to protect the worker. 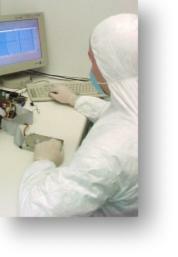 They are needed to protect an open hard drive from being contaminated by the worker. When is a Clean Room Needed? Some failures of hard drives involve internal mechanical or electronic problems. If a drive suffers an internal problem of any nature, it must be opened before we can determine what is required in order to affect a repair and recovery. It takes a high-tech environment with highly trained technicians to locate the problems and make the repairs, and, ultimately, to recover the data from a damaged drive. It's Expensive, But... Going to the clean room doesn't mean you'll be taken to the cleaners -- not with us. Some labs will flat-rate their work and quote an arbitrary, very high price before they even see the drive. That type of pricing is unfair, in our opinion, since it has nothing to do with the actual amount of work involved. Once we've completed an initial paid clean room evaluation, you'll get a real quote from us, and real information on the likelihood of a successful disk recovery.